Delta Green knows. Things from beyond space and time that lurk and titter in the shadows, the slow rot at the core of humanity, the dark stars that whirl madly above – these are the true masters of the world. Delta Green has been fighting since the 1928 Raid on Innsmouth, and the fight still rages on. This book is your weapon and your guide. The largest Call of Cthulhu sourcebook ever. Inside you’ll find a secret history of the 20th century and the movers and shakers who are players in the game: Delta Green, the outlaw conspiracy working inside the U.S. government to fight the darkness; Majestic-12, the clandestine agency that cuts deals with aliens and reports to no one; SaucerWatch, a UFO study group closer to the truth than they know; the Harotechnia, immortal Nazis who serve a risen Hitler; and the Fate, an occult syndicate that knows where the bodies are buried. Long out-of-print and never before in PDF, the Delta Green RPG is now available at the Flames Rising RPGNow Shop! Delta Green Countdown – The Countdown to the apocalypse has begun. As our darkened globe spins through the eternal night, the lasting legacy of the human race is nothing but a scream – drowned out by the roar of the destiny devouring us all. This is your last chance to show the cosmos what it means to be human: the will to fight. 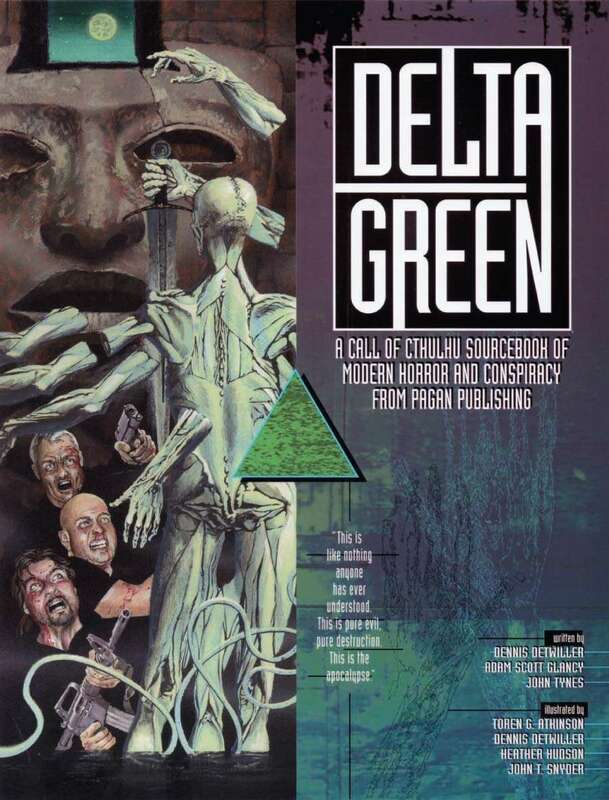 Delta Green: Alien Intelligence – These eight tales of cosmic horror and personal apocalypse were not written to make you feel secure about your place in the universe. They are here to unsettle you, to horrify you, and to challenge your misguided notions of history, humanity, and morality. Enjoy. Delta Green: Dark Theatres – Delta Green: Dark Theatres presents eight new stories of intrigue and horror, eight theaters in which desperate actors engage clandestine passion plays for the grim amusement of alien gods, Witness the horrors of the Raids on Innsmouth the terrible secrets of World War II, the tropical nightmare of Vietnam, the chill vacuum of Yuggoth, the asynchronous folds of space-time, and much more. The usher takes your hand and leads you into the dark. The red curtain rises, A silence falls over the audience.